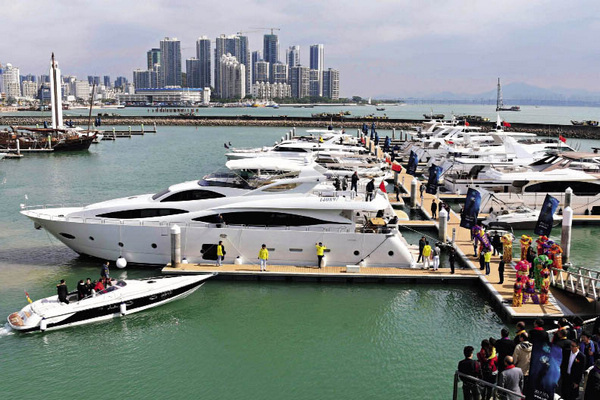 A ceremony to mark the first free yacht travel between Shenzhen and Hong Kong is held in the Shenzhen Bay on December 16, 2017. THE Guangdong-Hong Kong-Macao Greater Bay Area consists of the Special Administrative Regions (SAR) of Hong Kong and Macao and nine cities in neighboring Guangdong Province – Guangzhou, Shenzhen, Zhuhai, Foshan, Zhongshan, Dongguan, Zhaoqing, Jiangmen, and Huizhou, which sit in the Pearl River Delta. In 1980, Shenzhen was just a fishing hamlet when it was designated China’s first special economic zone. It has since attracted a spate of investment from adjacent Hong Kong and foreign countries, and now stands as one of the world’s most vibrant metropolises. In fact, the whole Pearl River Delta has thrived through economic cooperation with Hong Kong and Macao since the 1990s. Primarily in the form of processing trade for a good part of the past decades, this cooperation is now moving to a higher level involving more brainpower rather than manual labor. In this context, the Guangdong-Hong Kong-Macao Greater Bay Area is striving to become a city cluster with the world’s best economic and living environment that can rival the bay areas in New York, San Francisco, and Tokyo. Given its strategic significance to national development, it was mentioned in both the report to the 19th National Congress of the Communist Party of China (CPC) and central government work reports in 2016 and 2017. Last year the National Development and Reform Commission signed an agreement with the regional governments of Guangdong, Hong Kong, and Macao, which outlines the purpose, goals, principles, and priority areas of cooperation between these three areas. The innovative capacity of the Guangdong-Hong Kong-Macao Greater Bay Area has surged strongly in recent years. In the 2017 regional innovation capacity report by the Chinese Academy of Sciences, Guangdong Province, for the first time, took the pole position thanks to robust innovation and entrepreneurship in the region, largely accredited to generous investment in research and development. The province’s R&D input intensity stood at 2.85 percent in 2016, on par with that of developed countries. In neighboring Hong Kong, the resources of innovation are plentiful. For instance, it is home to three of the world’s top 100 universities. The Global Innovation Index 2017 report of World Intellectual Property Organization (WIPO) ranks Shenzhen-Hong Kong the No. 2 leading innovation cluster worldwide. With complimentary resources, Guangdong, Hong Kong, and Macao have the potential to coordinate their efforts for common development. Innovation is the fountain of life for this Greater Bay Area, which aims to become an international hub of sci & tech innovation. The Pearl River Delta National Independent Innovation Area, founded in 2015, will be the main engine for local innovation, and Hong Kong will lend its strength in development and management of hi-tech parks and business incubation. The Greater Bay Area will also tap into and import global resources and innovation, and join hands with laboratories and research institutes to build a world-class innovation base for hi-tech industries. The focus is on frontier and disruptive technologies – it intends to race to the forefront in the fields of quantum technology, new-generation information technology, third-generation semiconductors, new display technology, smart manufacturing, and precision medicine. A key backstop for the region’s innovation ambition is the 200-km Guangzhou-Shenzhen-Hong Kong Sci & Tech Innovation Corridor, which starts at the border between Guangzhou and Foshan, and transverses Guangzhou, Dongguan, and Shenzhen all the way to Victoria Harbor in Hong Kong. Along the route are several transport arteries, including the Guangzhou-Shenzhen Expressway, Guangzhou-Shenzhen Riverside Expressway, Pearl River Delta Ring Expressway, and Kowloon-Canton Railway. Designed as a key driver for China’s innovative development and a pioneer in reforming China’s sci & tech system, this corridor will extend on both the eastern and western banks of the Pearl River, and expand into a sprawling innovation zone in the Greater Bay Area that can rival global innovation leaders such as Silicon Valley and the Tokyo-Yokohama-Tsukuba cluster. 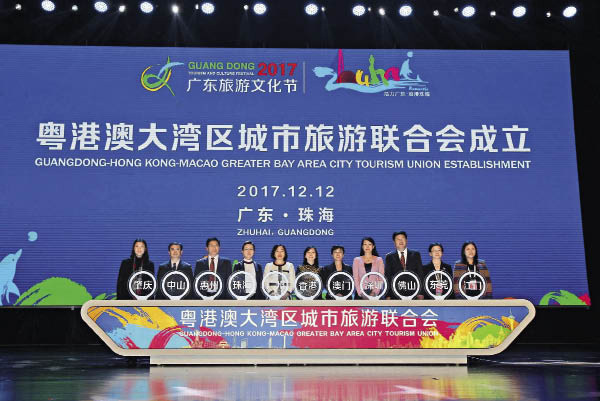 The Guangdong-Hong Kong-Macao Greater Bay Area City Tourism Union is founded in Zhuhai, Guangdong Province, on December 12, 2017. The Greater Bay Area needs a state-level coordination mechanism to boost coordinated development in the region. A coordinating organ should be formed, headed by state leaders in charge of Hong Kong and Macao affairs, and staffed by officials from both relevant central government departments and regional governments of Guangdong, Hong Kong, and Macao. On the basis of existing joint meetings for Guangdong-Hong Kong and Guangdong-Macao cooperation, a joint meeting mechanism of the Greater Bay Area should be established and an office opened to execute the state’s planning for the area under the “one country, two systems” framework. It is expected to be a long-term working mechanism with strong top-level design capacity and enforcement power. Coordination is also critical to solving intricate problems in the development of the Greater Bay Area, which involves “two systems” in “one country,” three separate customs territories, and four major cities. For a region of such size and diversity, coordination is a challenge on issues such as free flow of goods and factors of production, inter-city transport planning, cultivation of different industries of local strength, distribution of harbors and airports, intensive use of land resources, joint environmental governance, and provision of equal-quality public services. Close and effective coordination is also required to realize convenient custom clearance, transport infrastructure connectivity, synchronization of industries, full use of lands, and dissimilar urban development. A central goal of the Guangdong-Hong Kong-Macao Greater Bay Area is to build an excellent living and working environment with a developed education sector, stable employment, start-up service systems, and a thriving culture. To make itself a green, livable area attractive to both job seekers and tourists, this city cluster must take the path of green development, and has advantages in doing so given its geographical and natural conditions – benign climate, long coastlines, rich forest resources, and a good eco-environment. However, to achieve the goal of a beautiful environment, the area has to address both environmental problems resulting from breakneck growth over the past 40 years and those popping up in current development. To do so, it must increase awareness of environmental protection, stay above the environmental red line, and steadily improve the health of the local eco-system. A good eco-environment is the precondition for the construction of the Guangdong-Hong Kong-Macao Greater Bay Area, as providing high-quality public goods concerning the environment is critical for the region to gain a footing in global competition. The cooperation on green development will be intensified across the Greater Bay Area. Cross-region nature reserves and eco-passages will be built to form green shields for the region, and circular economy and low-carbon development will be promoted to give it a new competitive edge in economic structure, performance, and efficiency. In addition to economic benefits, these efforts will bring the region blue skies, clear water, and fresh air, significantly boosting local residents’ happiness index. The new round of China’s opening-up expands the space of the Greater Bay Area’s strategic development and encourages more participation in global competition. To build on its comprehensive competitiveness, the region will further clarify the functions of individual cities in the cluster to nudge them into orderly competition and dissimilar, complimentary development. The Greater Bay Area also stands out in the Belt and Road Initiative, which is aimed to become an open, inclusive platform of cooperation. Construction of the Guangdong-Hong Kong-Macao cluster is a key step of implementing this initiative, and will allow China to be more involved in international competition and the construction of international cooperation platforms. In return, the cluster will rise to a more prominent position in the country’s opening-up, and enhance its reputation and influence in countries along the Belt and Road. The “one country, two systems” principle and the separate customs territories in the Greater Bay Area give the region more institutional flexibility in aligning itself with international practices and joining the Belt and Road Initiative. The policies of the free port, special administration region, special economic zone, and pilot free trade zone all facilitate broader cooperation on trade and industries. Under the Belt and Road Initiative, Hong Kong’s role as the super liaison will be enhanced, its advantage in compliance with international practices will be given more play, and its economic ties with the mainland will grow stronger. Guangdong, Hong Kong, and Macao therefore should not only step up cooperation and opening-up between themselves, but also team up to explore the international market. The key to the construction of the Greater Bay Area is fostering a good living environment and shared development that entails providing area-wide public goods, improving both the “hard” and “soft” conditions of development, and realizing common prosperity. With the goal of building an international shipping and logistics hub, the area will boost connectivity of its harbor, high-speed railway, airport and subway networks, and attract goods, capital, and talents from all over the world. DR. YANG HAISHEN is an assistant researcher with the section of Hong Kong, Macao, Taiwan and international affairs research, Guangdong Academy of Social Sciences.